Get Ready for Movie Night with Disney #PixarCOCO! Whenever we are really super excited about a movie, the first thing my girls say as we walk out of the theater is, "Mom when can we watch it at home?!" Coco was no exception, my girls could not wait for a Coco movie night. 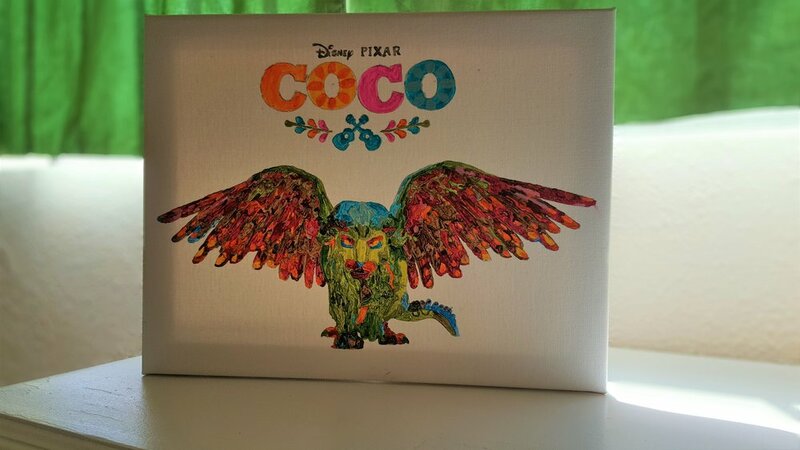 Well we've had Coco on digital for a couple of weeks now, but there is just something fun about getting the DVD too. Thank you to Allied Contigo for the fun crafts and gifts. 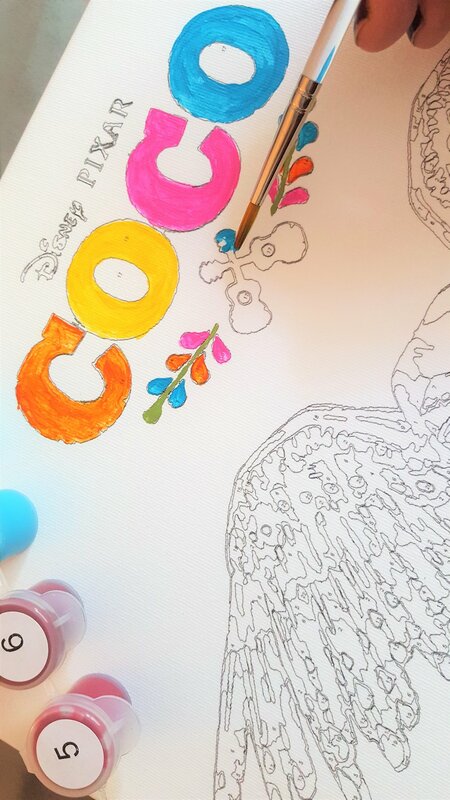 How cute is this COCO frame? I had so much fun painting it. Yes, I did it. I used it as an excuse to get some quiet craft time in for myself. Although, I think I'll go pick one up for my girls now. Frames play a key role in Coco. 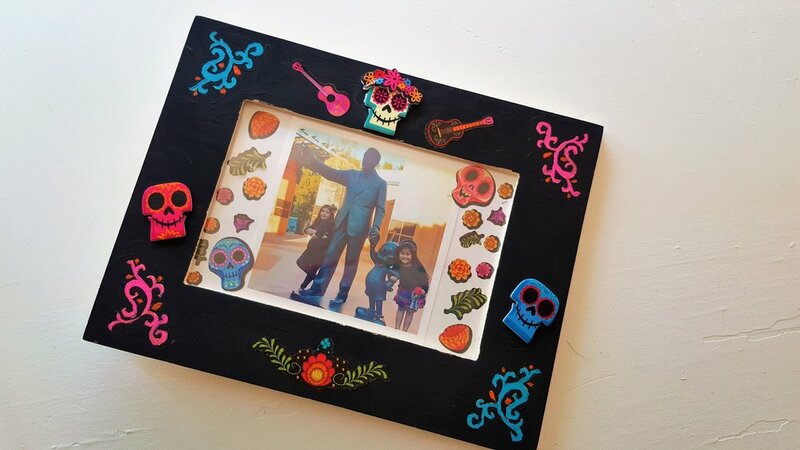 For Día de Muertos frames are used to display photos of loved ones that have passed and are placed on ofrendas. You can find these cute DIY frames at Toys-R-Us for $12.99. The frame set includes: 1 Wooden Frame, Sticker Sheet, Foam Sticker Sheet, 2 Markers, 6 paints and a paintbrush. Oh man, I have to say I haven't done something so challenging when it comes to crafting in a really long time. When I opened up this package my mouth dropped, the paint by number that I was thinking of was a lot less intense. But I was up for the challenge. And I have to say I was pretty proud of myself when it was done. Isn't it so pretty?! I can't wait to hang it up on the wall. My girls kinda loved it too and they were really proud of me. How would you like to win one of these fun DIY picture frames? All you have to do is leave me a comment below telling me your favorite character from Coco and don't forget to leave your email too so I can let you know if you win! Disney•Pixar’s “COCO” is NOW AVAILABLE in HD, 4K Ultra HD™, Movies Anywhere and 4K Ultra HD™ & Blu-ray™. 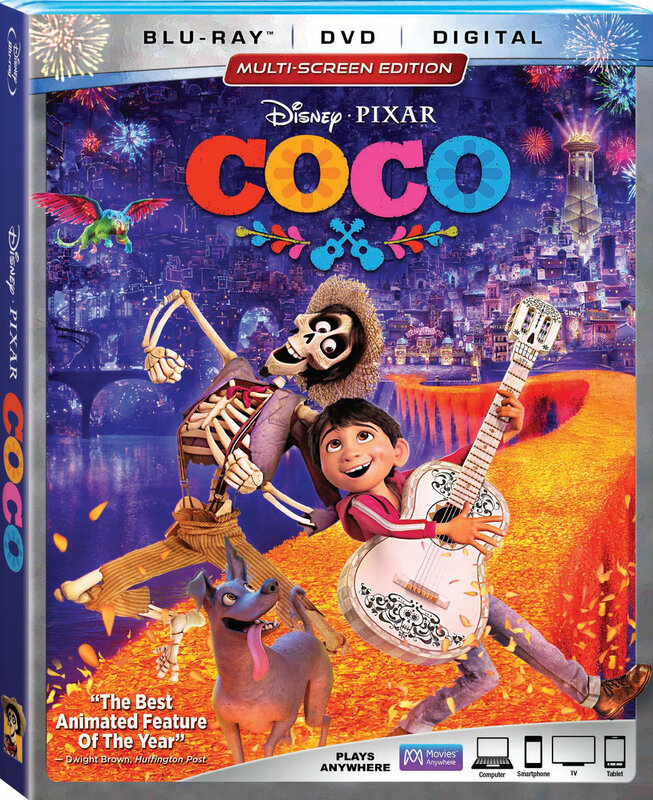 Disney PIXAR COCO Coming to Digital TODAY! I had the best time celebrating the upcoming digital release of Disney PIXAR COCO at the historic Placita Olvera or Olvera St. We were not only treated to a delicious dinner (and margaritas) at El Paseo Inn, but we were lucky enough to be in the company of Anthony Gonzales, the voice of Miguel accompanied by the Mariachi Divas and folklorico dancers.